substitution of an artificial ball and socket joint for the hip joint. Hip replacement is performed to relieve a chronically painful and stiff hip in advanced osteoarthritis, an improperly healed fracture, degenerative joint disease, or rheumatoid arthritis. Antibiotic therapy is begun before surgery, and the patient is taught to walk with crutches or a walker. During surgery the femoral head, neck, and part of the shaft are removed, and the contours of the socket are smoothed. A prosthesis of a durable, hard metal alloy or stainless steel is attached to the femur. A metal or a plastic acetabulum is implanted. The affected leg is kept abducted and in straight alignment with pillows; external rotation of the leg must be prevented. The nurse observes nerve function and circulation in the leg frequently during the first postoperative day. The most frequent complications are infection requiring removal of the new joint and dislocation. Ambulation begins gradually, with frequent short walks. Sitting for more than 1 hour is to be prevented, and hip flexion beyond 60 degrees may cause dislocation of the prosthesis. The patient continues an exercise program after discharge to maintain functional motion of the hip joint and to strengthen the abductor muscles. Weight-bearing may be modified according to the type of prosthesis implanted. Orthopedic surgery involving femoral head prosthetic replacement. 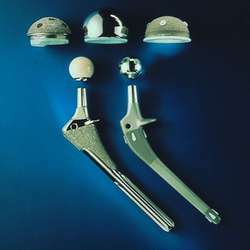 An operation in which the upper end of the thigh bone (femur) is sawn off, a short, angled metal shaft with a smooth metal or ceramic ball on its upper end is forced down into the hollow of the bone, and a plastic cup to fit the ball is fitted to the natural hollow on the side of the pelvis (the ACETABULUM). Advances reported late in 2003 include the use of two short incisions rather than one long incision and access via the separation of muscle planes rather than by cutting muscle. These technical improvements have made it possible for patients to return home the day after their operation. Q. Two weeks ago I fell and my back is still aching. What do you recommend I do? I'm 85 years old and have a history of 5 back operations. I fell a few times in the past couple of years, but I usually manage to live on my own and well. Recently I fell and hurt my left leg which is the one that I had a hip operation and of course problems and pain. I have resting and using my walking stick to balance myself better and I try to rest as much as possible. I know that time is the best healer, but i would love to see a video or read about my situation in order to improve my situation and learn new facts or tips. thanks you. Dr Paul Macnamara, consultant orthopaedic surgeon at MedCare Orthopaedics and Spine Hospital who carried out the hip replacement surgery on October 25, recounted Bandar's saga: "Blood supply to his left hip joint had been completely cut off resulting in necrosis of the hip bone, which had not been diagnosed then. At St Joseph's Hospital in Newport, the number of hip replacement procedures performed in its Orthopaedic Surgery Centre of Excellence increased by more than 40% from 2014 to 2016. 'My knee pain was caused by my stiff right hip' Colin Swenson suffered with major knee problems which stopped him from playing with his granddaughter. But after undergoing a total hip replacement the discomfort has completely disappeared, as he explains here.. Indeed, a total hip replacement can be life-altering, but to improve your recovery and maximize your results, you have to take some precautions after the surgery, bolster your health, and understand what you should and shouldn't do to preserve the longevity of your new hip. But, it turns out, a hip replacement no longer spells an automatic end to a dance career. The hip replacement market is segmented on the basis of product, distribution channel, end user and geography. With the common modern medical practice of hip replacement dating back to the 1950s, there have been several changes in the materials used as well as the procedure itself. average for total hospital and physician costs was $28,184 for knee replacement and $29,067 for hip replacement. Of this group, 53 percent of knee-replacement patients and 35 percent of hip replacement patients were still taking opioids at six months after surgery. Asia-Pacific Hip Replacement Procedures volumes by segment - Primary Hip Replacement Procedures, Partial Hip Replacement Procedures, Revision Hip Replacement Procedures and Hip Resurfacing Procedures. Approximately 300,000 hip replacement surgeries are performed in the United States each year and, without preventive anticoagulant treatment, the incidence of DVT ranges from 40% to 60% for primary elective hip surgery patients, accord ing to Boehringer Ingelheim. Performing Total Hip Replacement surgery on severe AnkylosingSpondylitic patient with acute deformity, required highly experienced and trained surgeon, infrastructure of super specialty level and knee implants of very fine quality. In a total hip replacement, part of the thighbone including the ball is removed and a new, smaller artificial ball is fixed into the rest of the thighbone.